For those who want a smart resort on the edge of the main village in Phi Phi Don, the Phi Phi Island Cabana Hotel could be the place for you. Large comfortable rooms in a low rise complex makes for a stylish stay on Phi Phi, one of Thailand's, true magnificent locations. Phi Phi Island Cabana Hotel is the islands first major resort and has a history that stretches all the way back to the first straw bungalows on the beach back in 1980. 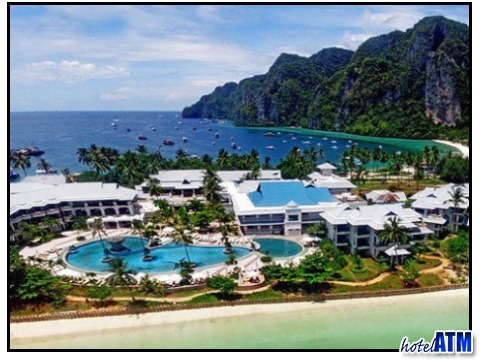 The hotel resort captures the best of both Tonsai Bay the deep sea entrance to Phi Phi and Loh Dalum, the dreamy northern beach where many idol away their time in perfect happiness. The 4 star Phi Phi Island Cabana Hotel sits on the beach front to two totally different bays and is pretty much the only resort to have deep water swimming off the beach at all tides. The pool is located on the quiet northern side and looks towards the cliffs of Nui Bay and Koh Yao Yai island. The hotel is dominated by the Tonsai cliffs which are a verdant jungle covered swath of paradise scenery. Phi Phi Island Cabana Hotel facilities. The pool and gym and Thai Massage rooms are the main attractions to make you time a memorable stay. The grounds of the hotel are the largest on the island and cover a huge flat expanse. This area has been planted with coconut trees and makes for a beautiful shaded area. The village is just 1 minute from the reception along the palm covered main path. Here you can find an Asian Bazaar like village of inter connecting streets and alleyways with no cars to get in your way. In the village you will see about 20 dive shops, 20 bars and restaurants and a hole host of shops devoted to the selling souvenirs, books, paintings and lots more. There are also banks ATM machines, 7 eleven Quickie Marts and a lot, lot more. This is a great place to wonder around at night and watch the rest of the world go by. 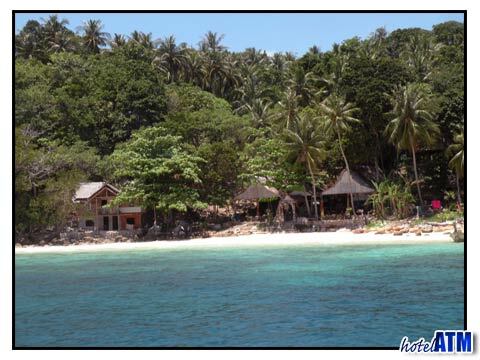 Phi Phi Island Cabana Hotel tripadvisor reviews rate the hotel nearer a 3.5 star than the 4 star it displays but this is not a major issue as the location is the key point of the resort. I think if you approach the pricing, the facilities and location as if it were a 3.5 star resort and make a decision as to it's value you get a good idea of this is the place for you. Those Phi Phi Island Cabana Hotel reviews. Phi Phi Island Cabana Hotel company owns and runs the Birds Nest Soup concession out of Phuket. The Bird's Nests are situated and farmed all over Phi Phi Don and Phi Phi Ley cliff mountains but it is in the Viking cave that this business is so striking. A huge cave as tall as a cathedral house tens of thousands of the swifts nest. This used to be a tourist attraction and you used to be able to visit the cave but it's popularity effected the birds and so it is not possible for normal tourism to visit.